Marguerite Gertrude Woodcock (reg. as “Margurite”) was born in Oxford in 1900. Her father was Henry Thomas Smalden Woodcock, who was born at Withycombe, near Exmouth, Devon in 1873/4 and was the son of the coachman George Woodcock. At the time of the 1891 census, when he was aged 17, he was a stableman at Nutfield, Surrey. Her mother was Emily Kennard, who was born in Lamberhurst, Kent, in c.1876 and was the daughter of the coachman George John Kennard. In 1891 when she was aged 14, Emily was living at home in Lamberhurst and working as a general servant. A stillborn and unnamed baby of “Mr & Mrs H. Woodcock” of Windsor Street buried in Headington Cemetery on 1 March 1919. Marguerite’s parents evidently began their married life in London, first in Paddington and then in Kensington, but by the time of her birth in early 1900 they had moved to Oxford. At the time of the 1901 census Marguerite (1) can be found at Alfred Place & Mews off St John Street, Oxford. (Alfred Place, now renamed Pusey Place, ran off the east side of St John Street, just to the north of No. 6). She was living with her father Henry (27), who was a domestic coachman, her mother Emily (24), and her older brothers Henry (3) and Douglas (2). Also living with them was Marguerite’s father's brother-in-law Walter G. W. Hammond (21), who was born in Lamberhurst, and a lodger: both of them were grooms. In about 1905 the Woodcock family moved up to Headington, and as they lived at Manor Cottage in Osler Road, Marguerite's father probably worked as the coachman for Colonel James Hoole at Headington Manor House. At the time of the 1911 census Marguerite (11) was living at Manor Cottage with her father Henry (37), still described as a coachman, her mother Emily (34) and her siblings Henry (13), Douglas (12), Ethel (8), Herbert (5), Dorothy (3), and Walter (two months). Later in 1911 the family moved to 7 Windsor Street in All Saints’ parish. On 9 November 1914 her brother Henry George Woodcock joined the Royal Navy to serve in the war. He was just 5 feet 3 inches tall, and advanced his age by one year to 18 in order to enlist. Her youngest sister Beatrice was born in 1916. 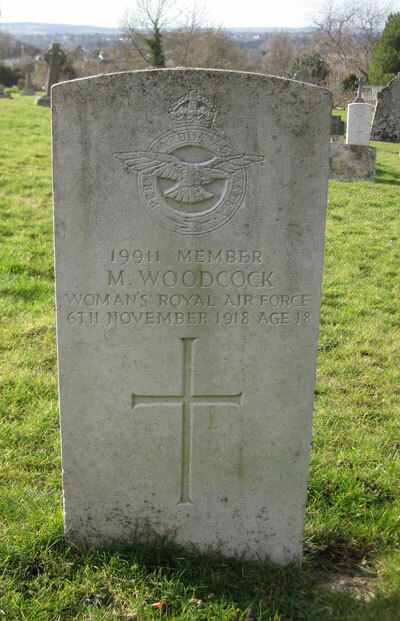 In the First World War Marguerite Gertrude Woodcock enrolled in the Woman's [sic] Royal Air Force on 9 October 1918. The WRAF was founded on 1 April 1918 at the same time as the RAF was formed by combining the Royal Naval Air Service with the Royal Flying Corps. It did not send women abroad., and Marguerite served at Lilbourne, Northamptonshire as a Member of the 44th Training Depot Station (Service No. 19911). She would have worn this uniform. She contracted pneumonia there, and died in the Headington registration district (which included the Radcliffe Infirmary) just a month later at the age of 18 on 6 November 1918. She was buried in Headington Cemetery two days later (9.4). 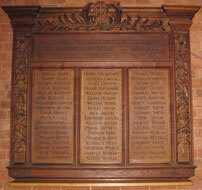 Even though she has a war grave in Headington, she is not remembered on the Roll of Honour of any Headington church. Thomas Woodcock died at 7 Windsor Street at the age of 68 and was buried at Headington Cemetery on 15 August 1942 (Grave ref. L80). Mrs Emily Woodcock was still living at 7 Windsor Street when she died at the London Road Hospital at the age of 68, and was buried with her husband on 20 October 1945. Henry George Woodcock (born 1897), described as a sheet-metal worker of Headington, married Daisy Callow at Deddington Church on 23 December 1933. He died in Oxford at the age of 70 in 1968. Douglas Avard Woodcock (born 1898) lived at 66 New High Street and then at 25 Barton Road, and was a sheet metal worker. He married Edith Doris Smith in Coventry in 1921, and their daughter, Edna Doris Woodcock, was born on 28 August 1923 and baptised at All Saints’ Church on 11 November 1923. Their son, Flying Officer Chris Noel Woodcock,also has a war grave in Headington Cemetery, but his is from the Second World War: he was an RAF pilot who died at the age of 22 on 1 September 1944. Douglas Avard Woodcock died in 1962 and is buried near his son in Headington Cemetery. Herbert John Woodcock (born 1906) married Dorothy Stella Grain (of the Butcher’s Arms pub) in the Headington district in the fourth quarter of 1930. (She too had lost a brother in the First World War.) Their son David J. Woodcock was born in the Oxford registration district in 1933 (reg. fourth quarter) and their daughter Jennifer M. Woodcock in 1939/40 (reg. first quarter of 1940). Herbert John Woodcock was living at 63 Quarry Road when he died at the Radcliffe Infirmary on 21 February 1953. Walter E. Woodcock (born 1911) lived at 25 Barton Road with his brother Douglas and was a watchmaker. Near the beginning of 1935 in Oxford he married Rose H. Harris, and in 1939 he was a petrol station assistant and motor driver living with his wife at 17 Coniston Avenue, Headington. They had three children. Walter died in Oxford at the age of 53 in 1964.